Coal was discovered at Selene, south of the new settlement of Monto, about 1925 by Jonas Thomas who was a Welshman and owned the farm were the mine is. He was sinking a well at the time. He got quite excited about the discovery as he was an experienced miner himself. His family back in Wales were miners and when they heard of the find a brother came out to Australia with the intention of starting a coal mine. It all came to nothing as there was no market for coal, not even the railway at the time and no money to develop it. The idea of a coal mine was to lay dormant for years. Selene mine opened in 1947 as Burnett Collieries by V & L Walkers who already had mining interests in the Ipswich area. The mine closed in 1965. At the time of closure 516,000 tons of coal had been produced. 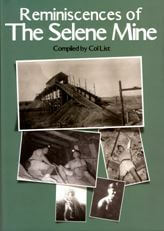 The story of the Selene Mine can be read in Reminiscences of The Selene Mine compiled by Col List.